After a wonderful evening in the restaurant the time to go home came. Leha as a true gentlemen suggested Noora to give her a lift. Certainly the girl agreed with pleasure. Suddenly one problem appeared: Leha cannot find his car on a huge parking near the restaurant. So he decided to turn to the watchman for help. Leha wants to ask the watchman $q$ requests, which can help him to find his car. Every request is represented as five integers $x_1, y_1, x_2, y_2, k$. 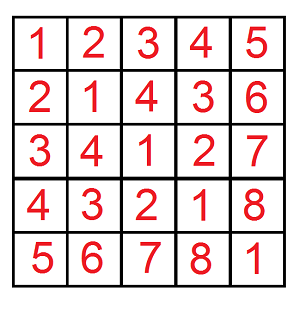 The watchman have to consider all cells $(x, y)$ of the matrix, such that $x_1 \leq x \leq x_2$ and $y_1 \leq y \leq y_2$, and if the number of the car in cell $(x, y)$ does not exceed $k$, increase the answer to the request by the number of the car in cell $(x, y)$. For each request Leha asks the watchman to tell him the resulting sum. Due to the fact that the sum can turn out to be quite large, hacker asks to calculate it modulo $10^9 + 7$. However the requests seem to be impracticable for the watchman. Help the watchman to answer all Leha’s requests. The first line contains one integer $q$ ($1 \leq q \leq 10^4$) — the number of Leha’s requests. ($1 \leq x_1 \leq x_2 \leq 10^9, 1 \leq y_1 \leq y_2 \leq 10^9, 1 \leq k \leq 2 \cdot 10^9$) — parameters of Leha’s requests. Print exactly $q$ lines — in the first line print the answer to the first request, in the second — the answer to the second request and so on.